When approaching your wedding there are a lot of decisions to make! One of those decisions is what to do with your hair. These days there are so many options but the most common options would be an up-do or let it down. Both styles look beautiful, but it all depends on your hair, dress, and theme! Go look at our last blog post to see how you can even incorporate flower crowns into the mix! The Braided top knot- Top Knots are all the rage now, not only for weddings but also for casual looks! 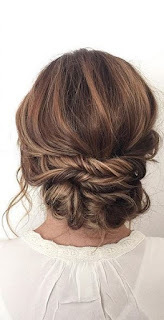 This beautiful bun with a large braid around it gives some strength to your look., allowing your full face to be seen and admired. The Crossover- Last but not least we have a newer trend in updos and its all about crossing over that hair! Still with a low bun, the hair stylist brings the other pieces of hair back and forth to get almost a fishtail look just above the bun! These styles all give your face a beautiful frame while also drawing attention to your hair! These styles work with almost every hair type and work great with high neck dresses or dresses with long sleeves.